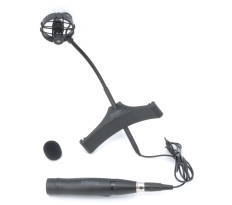 A totally new range of instrument mic systems for recording all your acoustic instruments live. The CL21 Lanen Cello has been designed for cellos and provides a very high acceptable sound pressure level. Cellos come in various sizes, so they need a fully adaptable mounting system. We have created a clamp which is flexible, ingenious and easy to attach. The mic’s flexible gooseneck allows you to place it at the very heart of the sound.